Maritime Messaging received support from the MacDowell Colony. Technology for Maritime Messaging is provided by Baruch College. What if water is a witness? Surrounding Brooklyn, and neighborhoods like Red Hook, water remains a constant in a rapidly changing borough. Human history fluctuates over time, rising and falling, ebbing and flowing, booming and busting. What if water has absorbed it all? In Maritime Messaging: Red Hook, a performance commemorating the five-year anniversary of Hurricane Sandy, artist Katherine Behar trained an artificial intelligence on the history of Red Hook in order to help the water to tell its story. Using underwater sound recordings, Maritime Messaging, produced in collaboration with PortSide New York and Pioneer Works, stages a mock conversation between the water of Red Hook and a digital assistant app that invites the water to send messages and translates its gurgles into words. 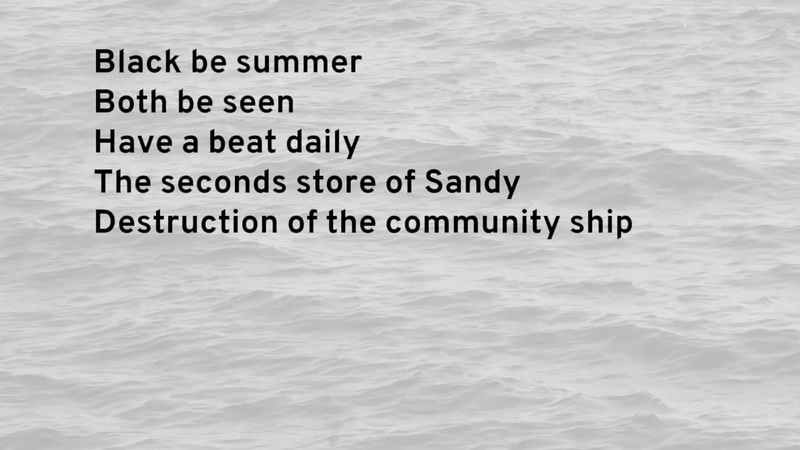 The resulting phrases are generated by an artificial neural network, a form of artificial intelligence, that worked with “Red Hook WaterStories.” The poetic outcome suggests a mysterious glimpse into the water’s muddled memories of Red Hook’s maritime past. Performances will take place on NYC Ferry boats traveling from Wall Street to Red Hook on Sunday, October 29, 2017, the 5th anniversary of superstorm Sandy from 10:25am-5:54pm. The performance will be accompanied by a sound installation on the MARY A. WHALEN from 9:30am until the end of the closing reception at 8pm. Additional information about the project, artist, and collaborators will be available on the MARY A. WHALEN throughout the day. A reception will be held on the MARY A. WHALEN, home of PortSide NewYork (Pier 11, Atlantic Basin, Red Hook, Brooklyn) from 6:00 pm to 8:00pm. PortSide New York supplied the content of their e-museum and community guide at www.redhookwaterstories.org as source material for the neural network to study. PortSide is a living lab for better urban waterways. PortSide brings WaterStories to life. PortSide programs the ship MARY A. WHALEN. PortSide gratefully acknowledges New York State Council on the Arts with the support of Governor Andrew M. Cuomo and the New York State Legislature.